Summer is coming and we all know what that means. Before even the first week of summer holidays is gone your kids will be complaining they are bored and having nothing to do. Well here are some great do-it-yourself projects and games they can do in the backyard to keep them busy. Best of all, you can even join in the fun! So get ready to introduce to your family the best bunch of DIY backyard games you have ever seen! DIY Backyard Games: Bean Bag Toss – You can make this game easy-peezy and be playing on the lawn in no time at all! Just stencil the bean bags and get ready to toss on the lawn. DIY Backyard Games: Life-Size Board Games – Ready for your own giant version of Monopoly or Snakes and Ladders? Check out the instructions for making your own life-size board games kids will love. 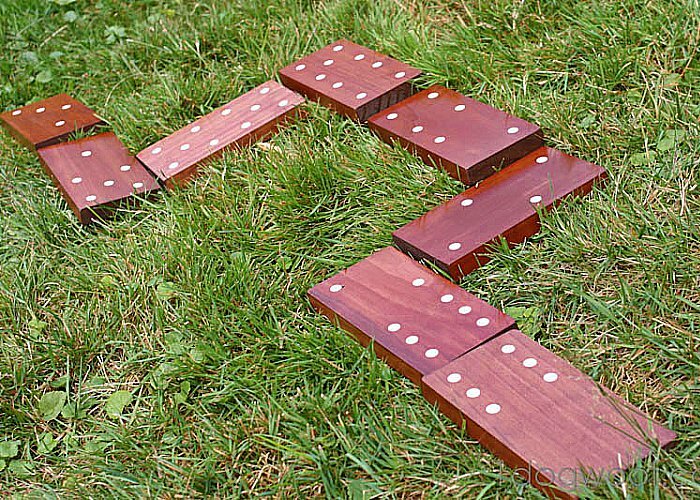 DIY Backyard Games: Dominoes – The adults may be fighting the kids off to play with this one. A bit of woodworking skills may be needed, but you can use these instructions to make them in an afternoon. DIY Backyard Games: Giant Dice – Well any giant board game should really have their own giant dice, shouldn’t they? You can use them in a bunch of different ways, as you will see in these easy to follow instructions for giant dice of all types. As you can guess, these DIY backyard games aren’t just for the kids. You can take any of these ideas and make them perfect for fun outdoor games for kids of all ages. Throw them in the car and bring them along on that next picnic in the park. Just don’t be surprised if everyone wants to join in on the fun! DIY backyard games can be fun in more places than just your backyard and for every member of your family.